If you own Samsung Galaxy M10 32GB, please do leave your feedback too. 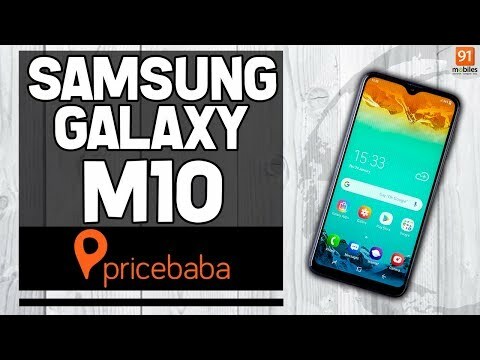 Lowest price of Samsung Galaxy M10 32GB price in India starts at Rs. 8,990 Samsung Galaxy M10 32GB is available on Amazon at Rs. 8,990. Prices updated on 19th April 2019. The Samsung Galaxy M10 32GB is one of the variants of Samsung’s M-series addition Galaxy M10. The device comes at a mid-range price segment with some decent features. To mention its feature, the large storage could be one to select the device over others in this price bracket. Also, it packs a well-built configuration that helps it run a long time. The camera is capable enough to produce good pictures and the battery can give it a long-time backup. However, the Samsung Galaxy M10 32GB lacks a fingerprint sensor, which can be a huge drawback for this device. The Samsung Galaxy M10 32GB features a TFT HD display of 6.22-inch that renders a pixel density of 270 PPI. The aspect ratio of 19:9 makes it look trendy. The display comes with waterdrop notch at the top of the screen which is the home of the frontal lens. The Samsung Galaxy M10 32GB is based on a Samsung Exynos 7 chipset and packs an octa-core Cortex A53 processor (Clock speed 1.6GHz). The configuration also includes a 3GB RAM, which helps it run smoothly. For the graphics, there is a Mali-T830 GPU. The operation is done by Android v8.1 (Oreo). In terms of optics, the Samsung Galaxy M10 32GB sports a 13MP main lens, which is paired with a 5MP depth-sensing lens. The set up can produce sharp pictures that users love to click more. The frontal lens of 5MP can also click nice selfies even in low light condition with the help of a screen flash. The internal storage of the Samsung Galaxy M10 32GB is what its name means, 32GB, can save multiple files and numerous data of the user. Not only this but the device also can support 512GB expandable memory when required. Regarding connectivity terms, the device comes with a lot of options like Wi-Fi, 4G-VoLTE connectivity, Bluetooth, Mobile Hotspot, GPS and many more. The Samsung Galaxy M10 32GB draws the charge from a non-removable Li-ion battery of 3,400mAh. It can give an ample back up for hours. The device comes with the Light sensor, Proximity sensor, Accelerometer and these sensors help the device to perform better.